05.04.11 We are very saddened to report the passing of Bernard "Doc" Mann on April 26th at the age of 101. He was a gracious gentleman and a true ambassador of the game we love. Our condolences to Doc's family and friends. He will be missed. Bernard "Doc" Mann during an interview with ChessMaine.net in 2006. 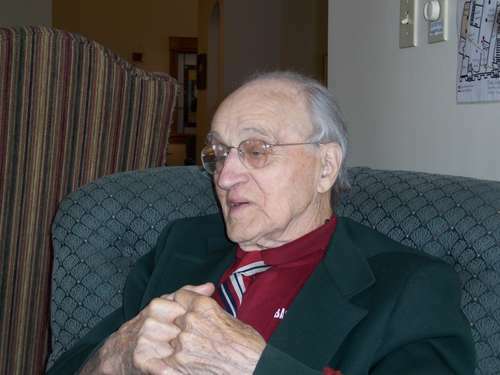 To read a wonderful story from the April 29, 2011 Bangor Daily News celebrating Doc's life click here. Happy Birthday Bernard "Doc" Mann: 100 Years Young! Doc Mann served as a counselor in the 1940's at a scout camp called Roosevelt. I was a camper for two summers and later served as a lifeguard on the waterfront. For me he was a real doctor and one of the best listeners I have ever known. His life will always be valued. If you knew Doc Mann a short time you would call him a gentleman. If you knew him longer you would probably add mentor. Doc put lie to the expression that we are all replaceable. So sorry to hear of Doc's passing. A number of years ago there was a simul at Borders with a master from Europe who was a student at UMO. Doc showed up in his usual garb i.e., coat and tie. He lasted in his game longer than lots of players. "Classy" seems the best description of his game and performance, that day and in his life.